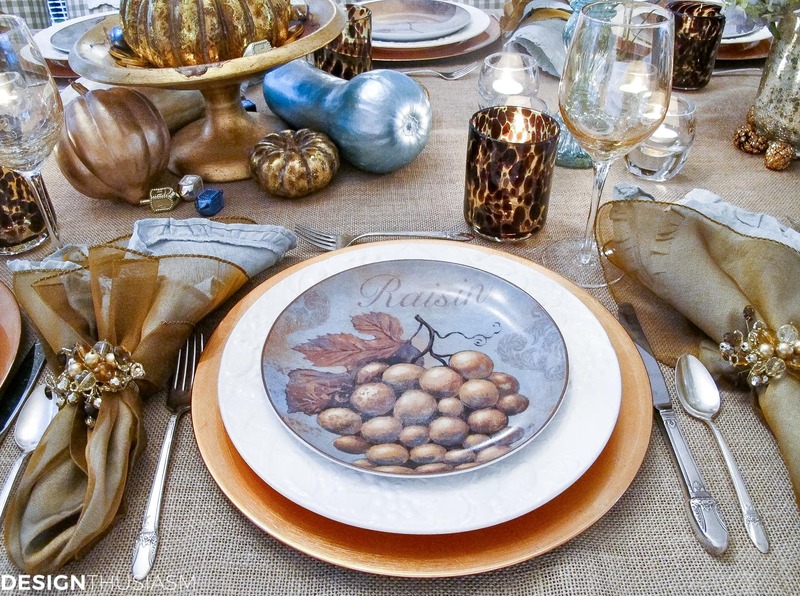 In this post: For elegant inexpensive Thanksgiving table decorations, look no further than gourd crafts. 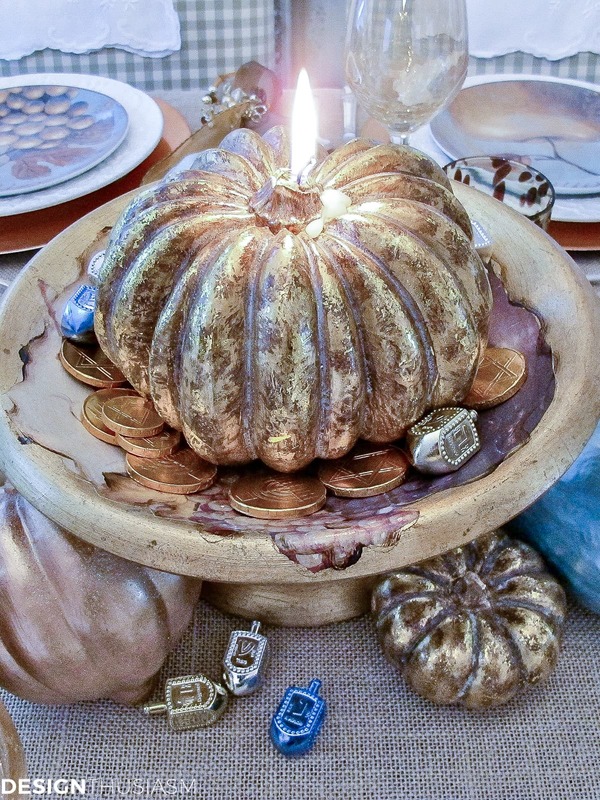 This DIY centerpiece brings personality to a unique holiday table. 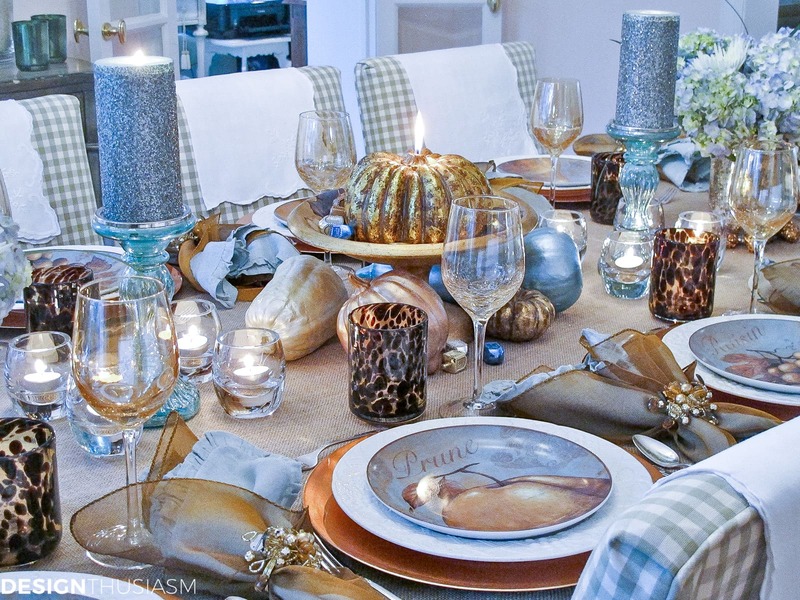 Each year, I love to approach my holiday table settings from a new perspective. If I did all oranges last year, you can be sure this year I’ll be going blush and cream, or golds with white. 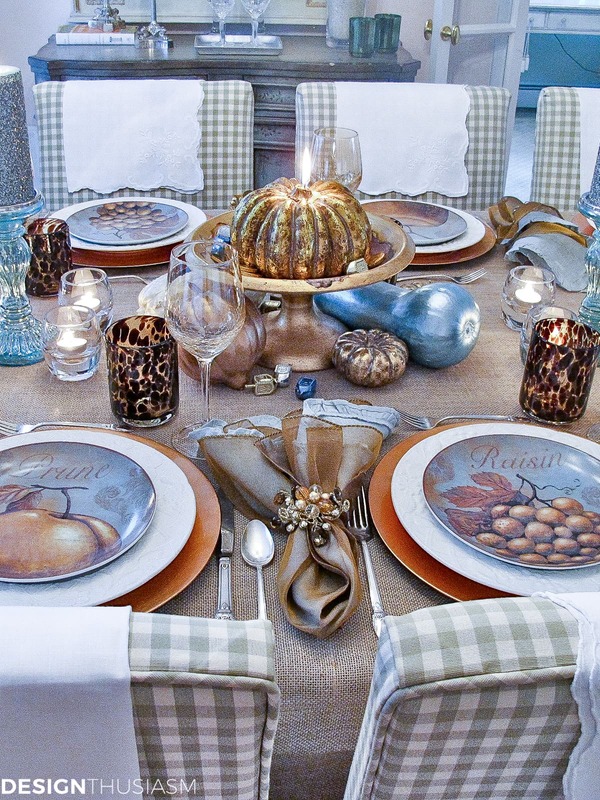 Not that long ago, a rare calendar event created a built in theme that inspired a unique Thanksgiving table. The circumstances of the holiday were so unique, that they’ll never occur again in my lifetime. 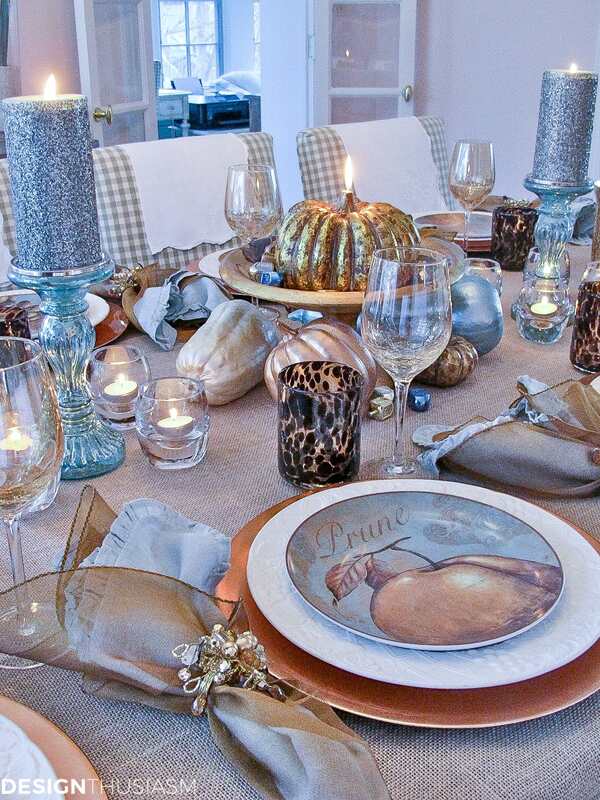 It was the one Thanksgiving where Hanukkah fell on the same day, and my table setting paid homage to both holidays. While this won’t be happening again anytime soon, it provided a chance to see a table set with the traditional bronzes of the season updated with the infusion of unexpected blues. The color feeling I went with is centered on the browns and golds of autumn, laced with the delicate blues that typify Hanukkah. 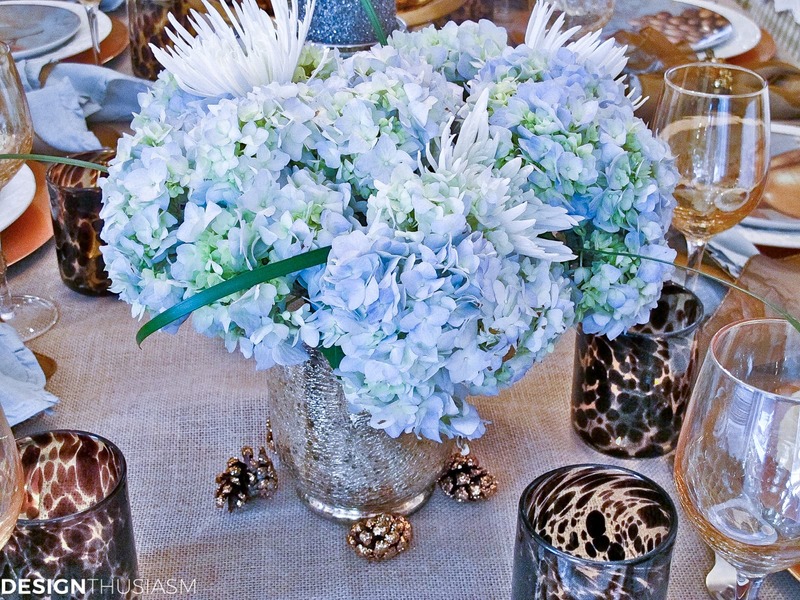 The hydrangea florals fit right into the story. 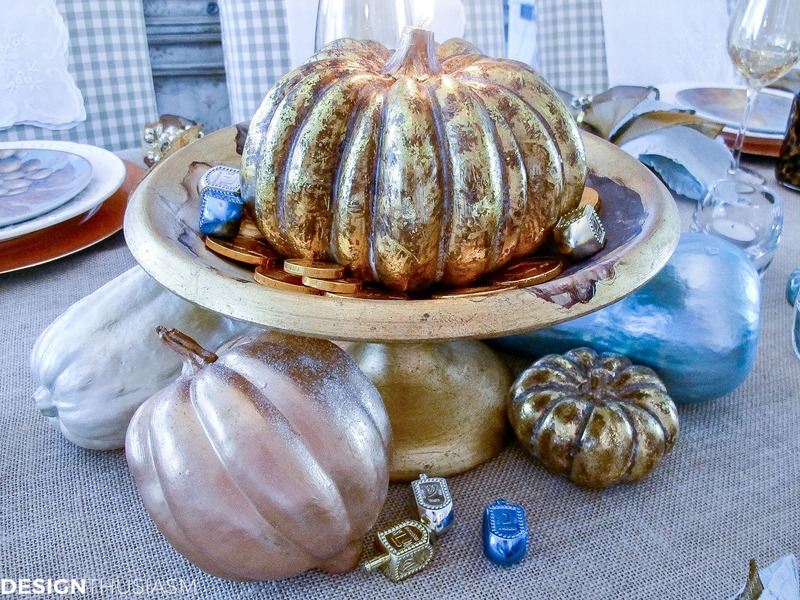 For elegant but inexpensive Thanksgiving table decorations, the DIY centerpiece revolves around a variety of gourds I painted with iridescent paint, happily strewn with dreidels and Hanukkah gelt. 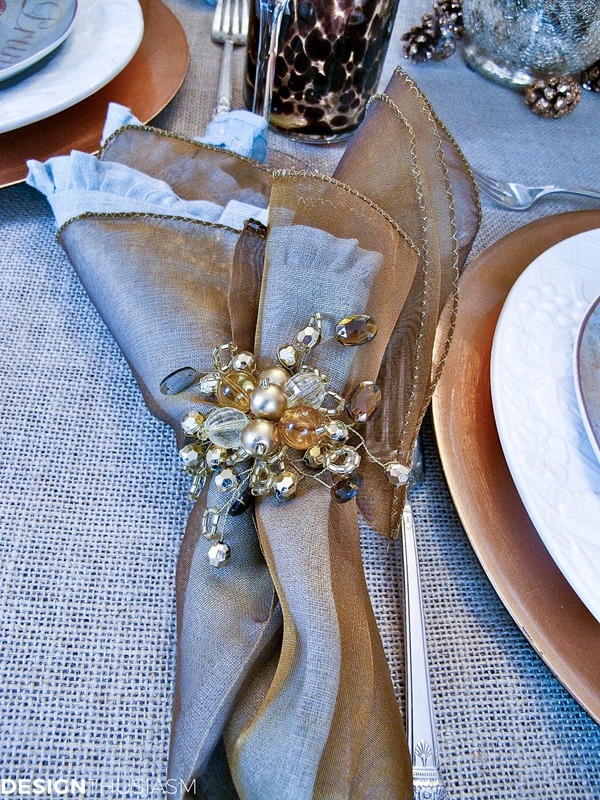 Layered napkins pair blue ruffled linen with bronze shimmer sheers, all wrapped in jeweled rings. Golden goblets serve wine, while tortoise shell glasses hold water. 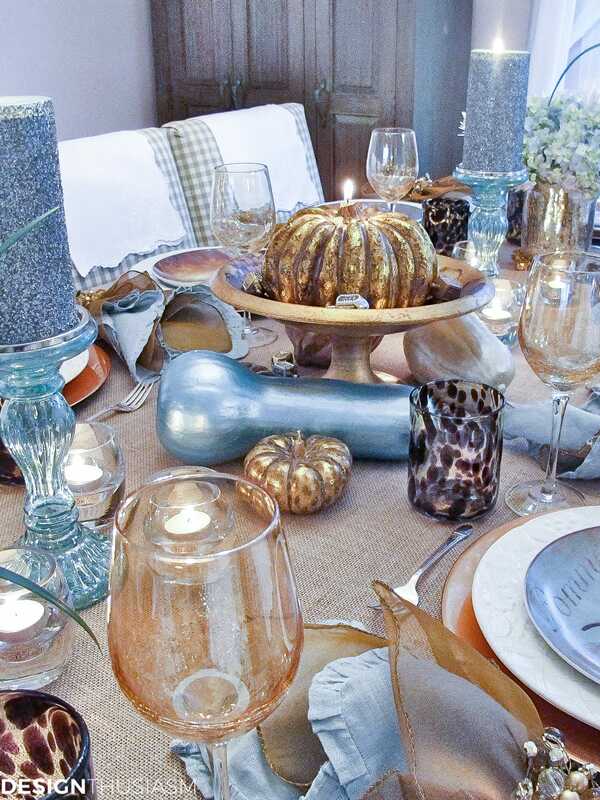 Despite the autumn palette, the table glows and shimmers, aided by glitter dusted candles and gilded touches. The variety of fruits can be seen in the long view. 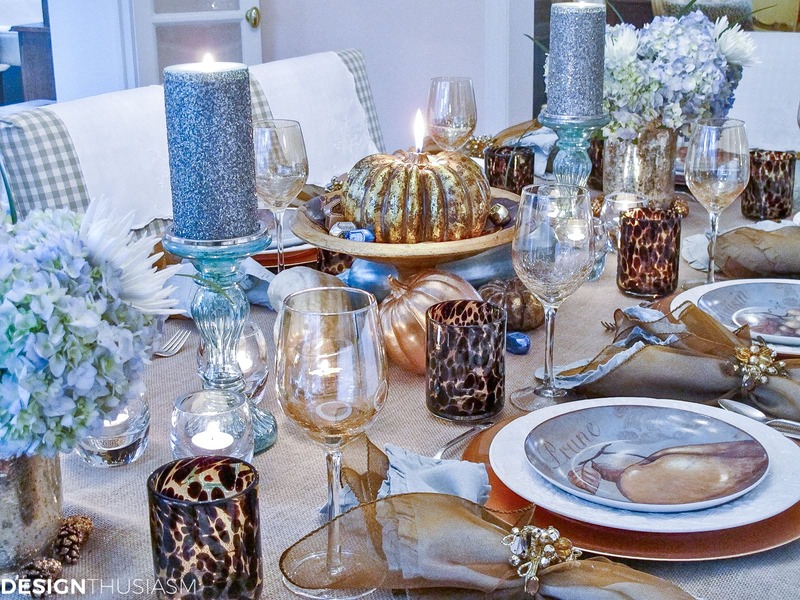 Candlesticks in blue mercury glass add another nod to Hanukkah. The centerpiece seen from above underscores the unusual holiday mix. 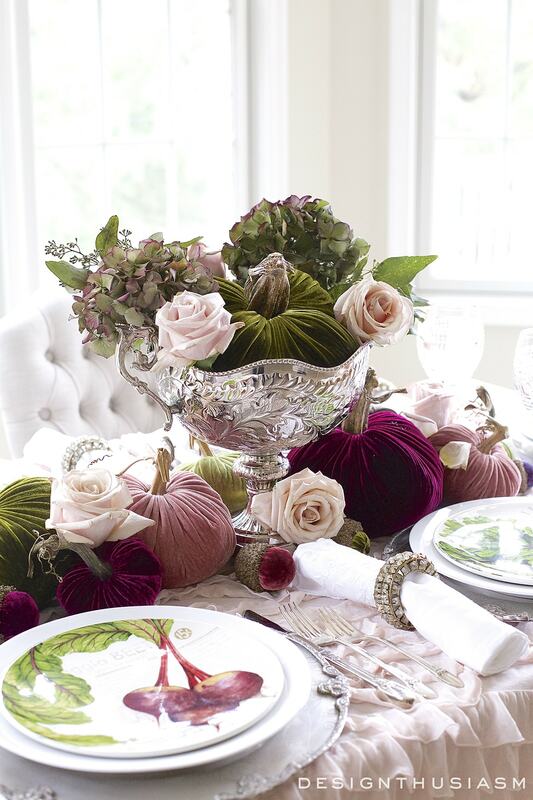 Glittered acorns add a festive touch to the autumn tableau, as the colors blend to give a homey glow. The full view hints at the feast that’s to follow. Potato latkes are served alongside turkey and trimmings. 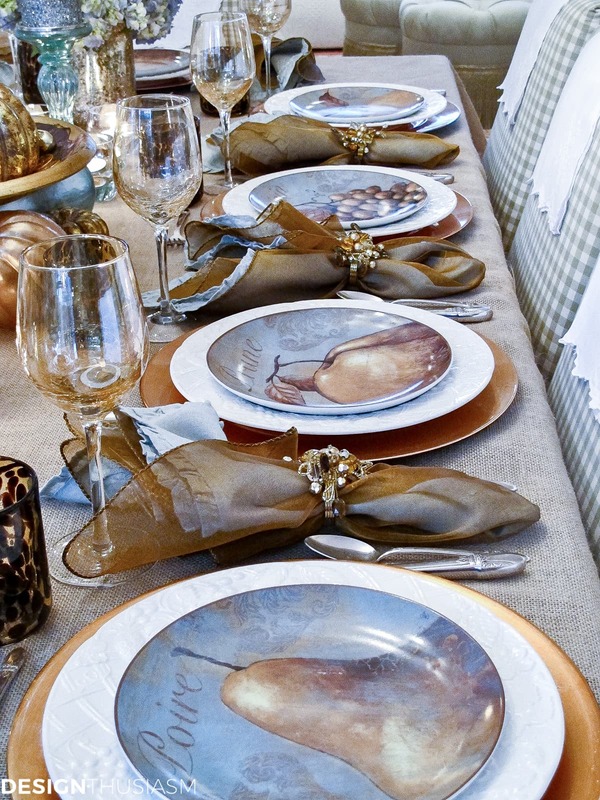 Can you think of another odd holiday pairing that rarely occurs together? Thank you so much, Nancy! I had the most fun painting the gourds to match… 🙂 Thank you for visiting and commenting. I really appreciate it! Thank you so much Susie! I guess it’s almost time to start thinking about next Thanksgiving… 🙂 Thanks for stopping by and taking the time to comment! How pretty! 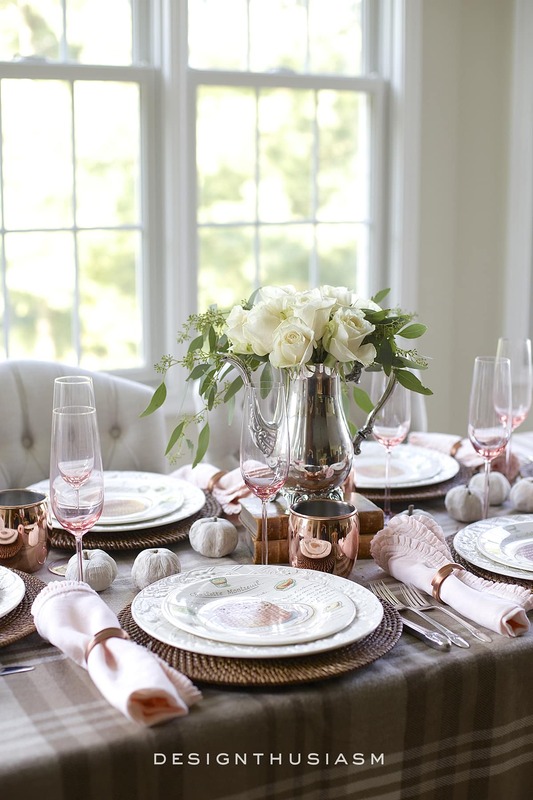 I love a nicely set table! 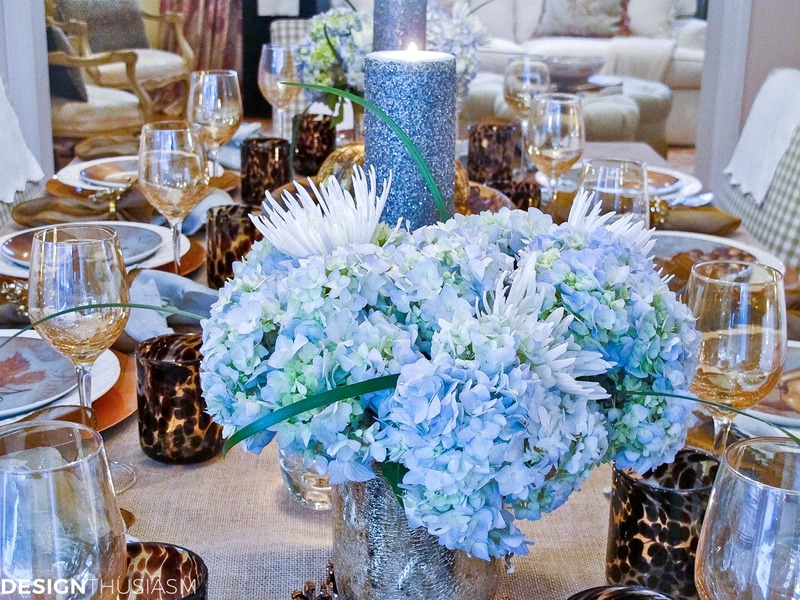 I never would’ve guessed the blue flowers would go so well with thanksgiving colors! Found you through the scoop! Thank you so much Angelina! I’m glad you found me… 🙂 Thanks for taking the time to comment! 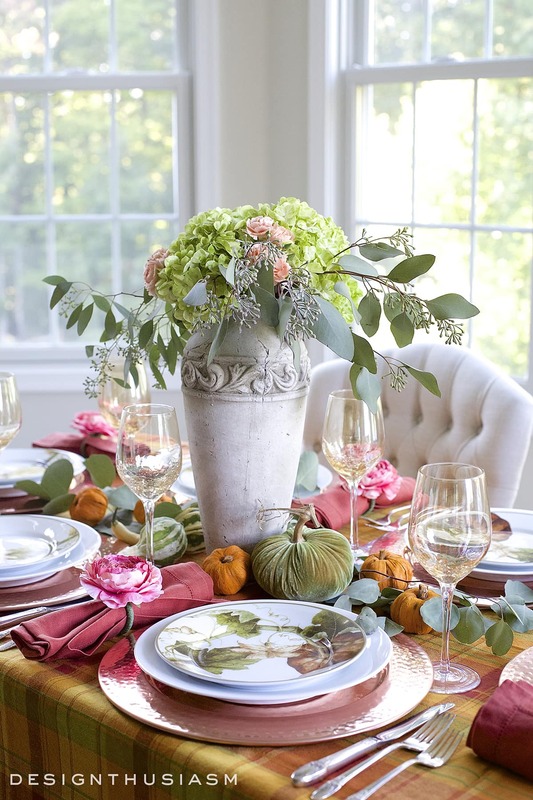 I have fell in love with this beautiful Fall table and your ideals are so great… keep your ideals coming and thanks for the tips on how to decorate your table! i love Design Thusiasm.